Historic Monuments and Sites of Ancient Quanzhou (Zayton) is part of the Tentative list of China in order to qualify for inclusion in the World Heritage List. What struck me during my recent China trip is that one is constantly time-travelling here: one city can be ultra-modern and the ‘next’ one still functioning in a time-warp 15 years back. This also is the case with Xiamen and Quanzhou, superficially similar cities located half an hour by fast train from each other on the South-East Coast. Where Xiamen feels like a subtropical version of Shanghai including the European architecture, Quanzhou is a run-of-the-mill Chinese city diligently working for progress. If we are interpreting the signs well, Quanzhou's historic monuments will be China’s WH candidate for 2020 after 'earning' a referral last year. Quanzhou had its heydays in the 10th – 14th centuries when it was an important stop on the Maritime Silk Road. The Chinese traded from here with countries in the Indian Ocean and the western Pacific. Quanzhou’s nomination undoubtedly will focus on its multi-religious character. Its Unique Selling Point for that is the Qingjing Mosque. Built in 1009, it today is the oldest Arab-style mosque in China. I visited on a Friday, it was prayer day and from all sides Chinese (and foreign-looking) Muslims were arriving. The old mosque has mostly fallen into ruins, but next to it is a new building that is still in full use. Tourists have to buy a ticket for 3 Yuan at the visitor center at the back before being allowed to enter through the impressive gate. The old part of the mosque complex consists of 2 former prayer rooms. One was built in Arabic style, out of stone and with a colonnade. When it collapsed as a result of an earthquake, a new place of worship was built. This time it was in Chinese style: it looks like a temple but where you expect an image of Buddha or some deity it has the mihrab. On the grounds you can also find some old writings, such as an Imperial Decree of the 15th century to protect Islam and its followers. Quanzhou does not have (historic) churches or synagogues, but does show the products of a very wide range of Asian beliefs. In the main street Tumen, next to the mosque, lies the Guan Yu Taoist temple. Confucianism is also represented in the same street. When I visited, the Guan Yu temple was very busy with people burning incense sticks and sacrifice stacks of 'money'. In the vicinity are all shops that sell that fake money and gold paper to burn. The WHS will consist of 16 different locations. I decided to visit another 2 in the afternoon. With a taxi I went to the Kaiyuan temple. This is the largest Buddhist temple in the city. So that was already the third religion of this day. This one is especially known for the 2 beautiful large pagodas. Here too, it was busy. In the large hall a service was going on under the supervision of monks, accompanied by drums and singing. Finally, another taxi took me to yet another part of the city - the different locations are not really within walking distance. Tian Hou Gong is a temple dedicated to Mazu, the goddess of the sea. She has kind of an own religion (Mazuism), is popular among fishermen and sailors in this province and across the sea in Taiwan. The temple has the colourful ceramic decorations that temples in Taiwan are covered with, although here in Quanzhou it is less exuberant. Quanzhou had to grow on me. In retrospect, I could have stayed a night there. There is a lot to see, but it is all rather scattered. There are also very few directions for tourists from the train station, so I first took bus 3 into the city center. You supposedly can take bus 601 along the various sights, but despite waiting at a designated stop none did pass within 20 minutes. I resorted to taking taxi’s from location to location. Among the 16 locations of the TWHS (now all mapped on this website! ), you can also find one of the oldest stone bridges in China and the largest statue of the philosopher Laotse. Both are slightly outside the city. Quanzhou is also proud to have 4 intangible WHS already listed: Nanyin Opera, Fujian Puppetry, the Mazu Belief and a 4th one that I couldn't identify. Quanzhou is located in Fujian province, on the southeast coast of China, around 100 km NE from Xiamen. It was a very important port and starting point of the Chinese maritime silk road during Middle Ages. From its Arabic name, Zaytoun, the English/French name of satin (sateen) was derived, because this fabric was originally made of silk. The history of city is shaped by its maritime trading connections and activities. A long time ago its historical heart was located closer to the sea; now port facilities are far from the city center. The nominated sites and monument are scattered around the city and its environs. And that means it is not possible to visit/see all components in one day, even if you have your own mean of transport. In total there are 16 components and they can be divided into three categories: 1. Sites and monuments related to maritime trade activities (examples: * site of worship: Jiuri Hill Relics and Inscription; * Administrative site: Shibosi Office Relic; * Navigation facilities: Shihu Docks, Fashi Docks, Wanshou Pagoda, Liusheng Pagoda; * Transportation facilities: Luoyang Bridge; Anping Bridge; *production sites: Kiln Sites at Jinjiaoyi Hill); 2. 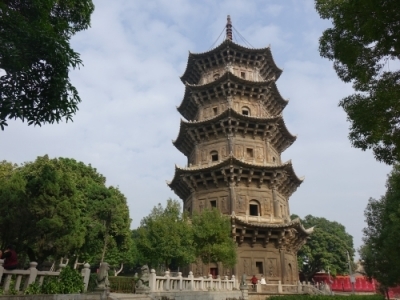 Sites and monuments related to culture/religion (Kaiyuan Temple – Buddhist and Hindu; Qingjing Mosque and Islamic cemetery – Islam; Cao’an Temple – Manicheism; Confucius Temple – Confucianism; Stone Statue of Lao Tze – Taoism; Tianhou Temple -Mazu, goddess of sea); 3. Sites and monuments related to urban development (city walls and gates; street layout of the old city). The city is ready for being inscribed on the WH list: most nominated places are very well signposted and have information in English. The new visitors center is located not very far from the train station, by the park in the northern part of the city where Lao Tze statue is located. You can get there by local bus. On the leaflet that you can get there from there there’s a map with all the components are marked. I was told that next year they will launch a new bus line connecting the most impressive monuments. Now you can cover most on this route using local buses, by foot and by taxi. Almost all monuments are from Song and Tang dynasties. 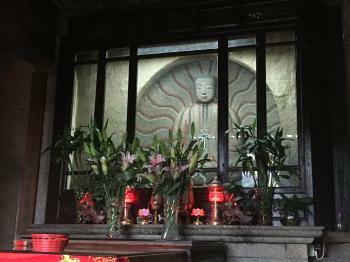 Only statue of Mani (photo) in the Cao’an temple is from Yuan dynasty. And this is the only one which is not located in Quenzhou, but in the neighbouring city of Luoshan town, Juinjiang. This relief is the world’s only remaining statue of Mani, founder of Manichaeism. Note, that the small temple closes at 5pm. The most impressive is the statue of Lao Tze; they will tell you that this is the biggest in Fujian, but in my opinion the bigger one (although much younger) is located in the Wuyi shan (another WHS). This is the itinerary that let me see most of the nominated components in one day: Lao Tze statue → Islamic Holy Tombs → Shibosi Office Relic → Kaiyuan Temple → Zhongshan historic neighbourhood → Quingjin Mosque → Tianhou Temple → Cao’an temple. Renomination, with a name change from "Monuments and Sites of Ancient Zayton in Quanzhou on the Marine Roads"